The Bradleys Head walk – either the short walk around the headland or longer on to Chowder Bay – deserves to be more popular. 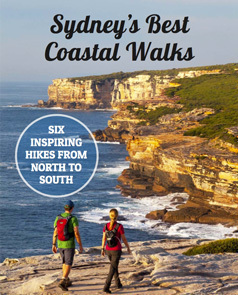 It's an easy walk with unrivalled Opera House, Harbour Bridge and city views from the grassy expanse of Bradleys Head. Just a short ferry ride from the city's business district takes you through an old Angophora forest – towering Sydney Red Gums – along the harbour foreshore. And once you understand the stories of Bradleys Head, the walk near Taronga Zoo takes on another, more rewarding dimension. Time: 2 and a half hours there and back. Allow extra time to enjoy Chowder Bay. Difficulty: Clearly defined track, often footpath or timber walkway. Some stairs. Coffee: Bacino Kiosk at the turn-around point at Chowder Bay. Toilets: At Bradleys Head Amphitheatre and at Chowder Bay, Clifton Gardens. Swimming: Unpatrolled sheltered harbour beach at Chowder Bay, Clifton Gardens. There are less than 20 car parking spaces at Bradleys Head and you'll pay $8 NPWS park entry fee. There is much more parking at Taronga Zoo, where you'll pay $18 for the day and have to walk down a fairly steep hill. Regular ferries from Circular Quay service Taronga Zoo. It's a 12 minute ride across the harbour. The route is frequented by public ferries where an Opal Card is valid, as well as ferries with tour commentary and Taronga Zoo ticket inclusions. The M30 bus from the city will take you directly to the Zoo in 30 – 45 minutes, although it's far less scenic (and longer) than the ferry across Sydney Harbour. Check Transport NSW for public transport information. It's a far better experience catching the Taronga Zoo ferry from Circular Quay. The Bradleys Head to Chowder Bay walk is a loop track to/from the ferry. After leaving the cityscape views from Bradleys Head, you’ll enter a grove of angophora trees, their twisting limbs framing the harbour. From here, you’re following the Taylors Bay track winding along the protected foreshore in Sydney Harbour National Park. The easy-to-follow track eventually opens up to Chowder Bay and the former pleasure grounds of Clifton Gardens. If coffee and cannoli is your idea of a reward, make your walk’s turn-around point the Bacino Kiosk at the far end of Chowder Bay. That said, walking a bit further on up the hill to Georges Head will offer rewarding views from the next headland. There’s a reason for those old canon placements: the view over Middle Harbour is expansive. If you were to continue on, eventually you’d get to Balmoral Beach… but that may be an adventure for another day. How Did Bradleys Head Get It's Name? This headland was called Booraghee by the native Cammeraigal people for thousands of years before European arrival. When the First Fleet of convicts arrived with the Royal Navy in 1788, Lieutenant William Bradley was second-in-command of the fleet and First Lieutenant of the HMS Sirius. He landed here with Captain Hunter in January 1788, the first non-Aboriginal people to do so. Bradley was a skilled cartographer and he and Captain Hunter charted Port Jackson (later to become known as Sydney Harbour) together. He was also a watercolour painter and diarist. In 1814, after forced retirement from the navy suffering mental illness, he was caught posing as a ‘Captain Johnson’ of a non-existent ship, the Mary and Jane. He had presented hundreds of bogus letters to shore post offices to be sent to the Admiralty, and was paid 2 shillings per letter, as per regulations. Bradley was eventually caught and sentenced to death. This sentence was commuted to transportation for life to Australia. However after pleas from his family (he was related to James Bradley – Astronomer Royal) he was exiled to France where he later died. Thereby escaping the ultimate irony of being 2nd in command of the First Fleet and later being transported as a convict to the colony he helped found. We may receive a small commission if you book via our affiliate link. Thank you!